The first thing that one notices about this lens is how flat, small and light it is — no wonder that it is known as "the pancake." It is a result of the late 1970’s push towards compactness, and is designed to be the perfect companion to the M-series Pentax bodies. 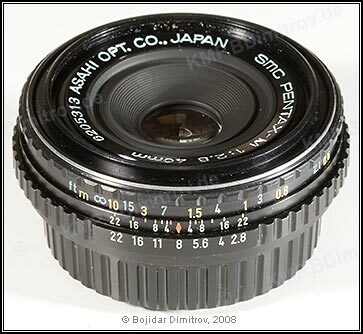 Due to their small size, the focusing and aperture rings are rather difficult to use. Contrary to the popular belief, this lens is not very rare. When the lens was available new it was priced at about US $75.